Under the summer's sun, Ontario's complicated electricity pricing mechanisms are increasingly causing functionally arbitrary pricing in the province. For 2011 Ontario introduced a second global adjustment category, class A, intended to lower the cost of power to large users. Prior to winning a majority in this year's election, the Liberal government initiated the expansion of the Industrial Conservation Initiative, which is the program where the "class A" global adjustment customer can lower their electricity costs by lowering their share of generation during 5 peak demand hours. It is increasingly clear that Ontario's system operator can't determine Ontario's actual peak demand hours. The reason for this is the growth of generation embedded within the local distribution grids serviced by the IESO's grid - primarily solar. Embedded generation impacts the IESO by lowering the demand for supply from their grid. The evidence of the failure is apparent in the changing characteristics of the 5 "coincident peaks" indicated by the IESO from it's first "Base Period", from May 1 2010 to April 30, 2011, and the period ended April 30, 2014. The peaks for the first base period, which all occurred in the summer of 2010, were usually during hour 16 (4-5 pm), but 3 years later the peaks usually occurred during hour 17. The move is not likely due to a changed demand profile, but because of legislation that doesn't consider embedded generation. A look at the figures for completed "base periods" shows the growth in the embedded generation figures collected for the high 5 hours. I've discussed these issues before , but the issues have grown in importance with a cool summer. Up until 2014, peak hours were being moved slightly, but evidence suggested Class A customers were curtailing consumption for a number of consequetive hours on the hottest afternoons anyway ; a change in the peak from hour 16 to hour 17 could make a difference in annual electricity charges of millions of dollars, but probably it would not be significant. 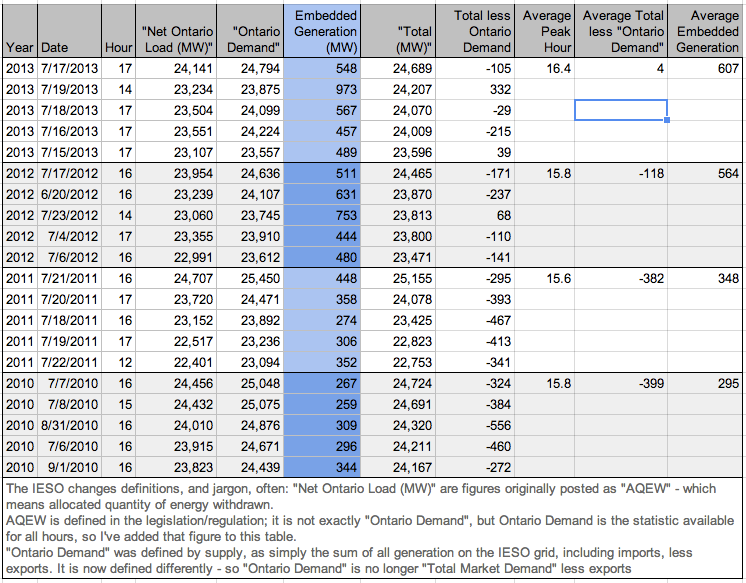 Currently the IESO shows hour 19 of July 21st as one of the currently periods top 5 "Ontario Demand" hours - a date I examined in some detail. Moving the demand peak into the early evening is likely to have major financial impacts for some class A customers. Moving the peak by seasons will have a great impact on the ability of class A customers. The IESO noted on Twitter that July's "Ontario demand peak" wasn't as high as January's - I noted it wasn't as high as December's, February's or March's either. If not for the impact of embedded generation, particularly from solar panels, lowering the demand on the IESO's direct suppliers, only January would positively have had a higher peak than July. It is increasingly likely that Class A customers will now spend a full year looking at demand forecasts to guess hours the high 5 coincident peaks may occur. The cool summer of 2014 may be an exception, but it is also a possible indicator of how the highest "coincident peaks" may move in the coming years - away from daylight hours, and back to winter evenings.